Daniel Naudé is a photographer from my hometown of Stellenbosch, South Africa who is well-known for his amazing photographs of South African animals, which were showcased in his debut exhibition Animal Farm (and book – which i suggest you buy stat). for the past two years Daniel has been working on his next exhibition Sightings of the Sacred, travelling to Uganda, Madagascar and India to photograph cattle in societies where they are considered sacred. For the past two years Naudé has focused on photographing cattle in societies where these animals are revered and venerated. This is a position far removed from the Western world where they are mostly seen as productive sources of milk, meat and skins. 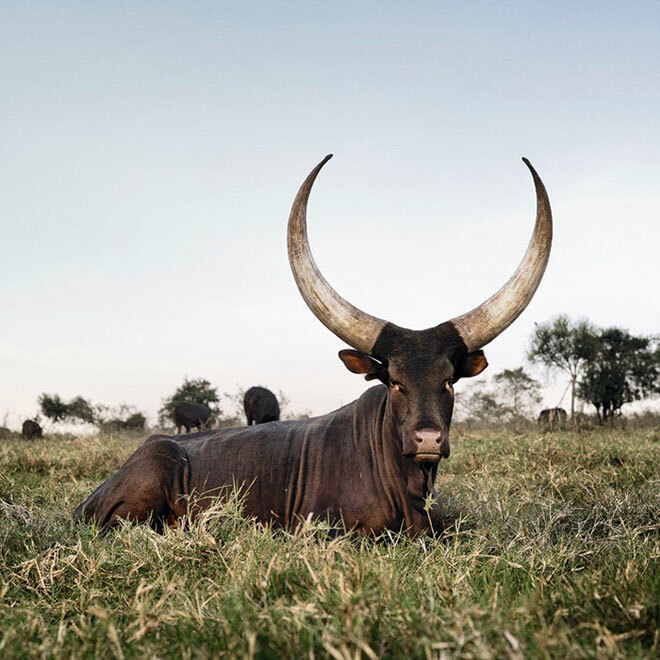 Naudé first photographed the Ankole cattle in Uganda, renowned for their majestic horns which ideally curve out and then inward, forming a shape like a lyre. In his portraits of cattle, Naudé brings into our time the long tradition of depicting the natural world with its rich references to classification and comparison. i have known Daniel since school days, so it’s even more awesome to see his wonderful work celebrated both here and internationally (his work was recently shown at Paris Photo in LA, follow him on Instagram here). you can catch the exhibition at the Stevenson gallery in Cape Town till the end of May or see the entire exhibition online here. Wow, Daniel’s work is stunning. Do you think he’d be interested in a little email Q&A for the interview series on my blog? won’t hurt to get in touch and find out. These are gorgeous. I am definitely going to start following him on Instagram. His work really brings in the light the color from this people life. Flip his work is stunning! His work is beautiful! Is there anywhere I can buy his pictures online?